SFTPPlus, as well as other standard SFTP clients and servers, make use of SSH DSA and RSA keys for implementing an authentication method that allows partners to exchange credentials over insecure connections. When SSH key authentication is used, the credentials are formed by associating a username to an SSH key pair. The SSH key pair contains a public part and a private part. To exchange credentials, partners will each generate an SSH key pair on their own computers and will send the public part of a key pair to their partner. Their partner will then use it to configure SFTPPlus to only accept SFTP clients that can prove they have the private part of the key pair. An SFTP client that only holds the public key part of the key pair will not be able to authenticate itself to SFTPPlus’ SFTP service. SFTP clients and servers can choose to store the SSH key pair in their own format and unfortunately there is not a single format used by all SFTP software for storing and managing SSH keys. This documentation covers SSH key management for some of the most popular SFTP software. The OpenSSH project provides a set of programs that implement encrypted communication sessions over a computer network using the SSH protocol. It was created as an open source alternative to the proprietary Secure Shell software suite offered by SSH Communications Security and is available for many operating systems such as Linux, AIX, HP-UX, Solaris, z/OS and more. ssh-keygen will ask you to provide a passphrase to be used for encrypting the newly generated SSH private key. If you enter an empty password and the SSH private key will be stored on the local disk in unencrypted format. You can replace rsa with dsa to generate a DSA key pair. You can replace KEY_COMMENT with any text that should help you identify the key (more so, its purpose) at a later time. PuTTY is a free and open source application which acts as a client for the SSH, SFTP, SCP, and Telnet protocols. PuTTY is available on many Unix operating systems, but is most commonly used on Windows operating systems. puttygen will ask you to provide a passphrase to be used for encrypting the newly generated SSH private key. You can enter an empty password and the SSH private key will be stored on the local disk in unencrypted format. The command will create the KEY_FILENAME.ppk file that will contain both the public and private part of the SSH key pair. PuTTY stores SSH key pairs in a format that is not compatible with the OpenSSH project or SFTPPlus. The puttygen tool can be used for converting an SSH key stored in PuTTY format to a key stored in OpenSSH format. Open puttygen, select the type of key to generate and the number of bits for the key. Click “Generate” and move your mouse over the blank area until the keys are generated. Provide a passphrase to be used for encrypting the newly generated SSH private key. You can enter an empty password and the SSH private key will be stored on the local disk in unencrypted format. Add a comment that should help you identify the key (more so, its purpose) at a later time. Clicking one of the ‘Save public key’ or ‘Save private key’ button saves the SSH key pair in a format that is not compatible with the OpenSSH project. To export an already opened key: Conversions -> Export OpenSSH key. To export the public key in OpenSSH format, open a text editor and copy-paste the contents of the “OpenSSH public key” text box. Save it as a plain text file. The PKCS#12 format is either a .PFX or .P12 file which contains the private key with its X.509 certificate and also optional CA certificates. In this example, we will be using the .PEM extension for later use to extract the OpenSSH public key. Using the X.509 .PEM encoded certificate, extract the public key by following the instructions in the next section. This section describes the method to extract the PKCS#8 public key from an X.509 .PEM encoded certificate using the openssl toolkit. Following that, use the ssh-keygen toolkit to convert the OpenSSH public key. If the X.509 certificate is not stored as a PKCS#1 .PEM format, then it is stored in another format with common ones being .CRT, .CER and .KEY. 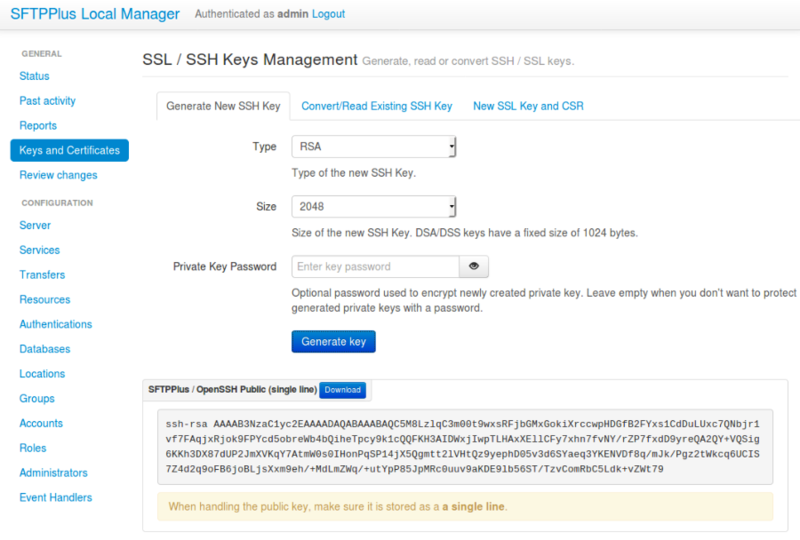 With this format, you can now associate the OpenSSH public key to the account that requires it either in the Local Manager GUI or in the configuration file. Users can also generate new SSH keys and convert/read existing SSH keys via the SFTPPlus Local Manager.